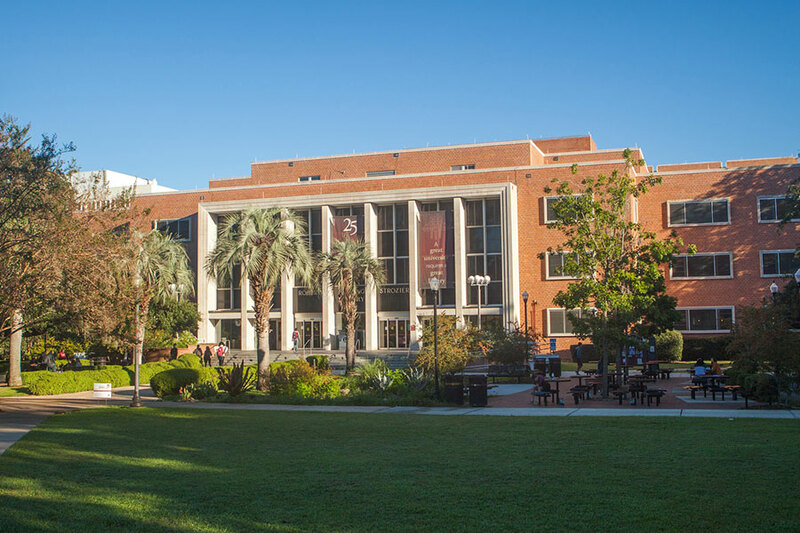 Strozier Library is Florida State University's main library. Florida State University Libraries will host a free one-day symposium focused on raising awareness about Open Educational Resources (OER) and their potential to support student success by reducing textbook costs and creating opportunities for open, learner-centered pedagogy. The Open Education Symposium, a professional development opportunity for faculty and students, will take place from 9 a.m. to 5 p.m. Thursday, March 8, in Strozier Library’s Bradley Reading Room. The symposium will feature distinguished speakers, collaborative sessions, panel discussions and a keynote address by David Wiley, chief academic officer of Lumen Learning. Registration is free, and participants are welcome to attend the entire event or individual sessions. Participants can also attend remotely via a live webcast. For more information, visit bit.ly/opened-symp. The program is sponsored by FSU’s University Libraries, College of Education and College of Communication and Information.